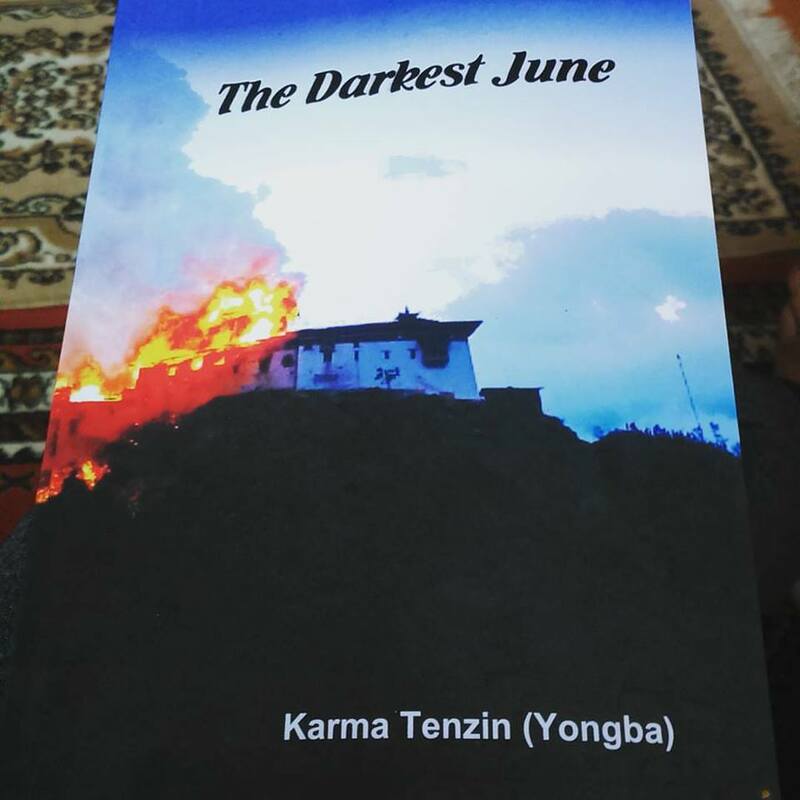 The cover of The Darkest June with the picture of Wangdue Dzong on fire was enough to fascinate me. I wondered how could anybody build a story around June 2012 Wangdue Dzong fire but again it was Dasho Karma Tenzin Yongba, who could be trusted to do something strangely bold. Having served in the police force all his life crime story was his love story. His first novel The Restless Relic and collection of short stories Barnyard Murders were testimony to his mastery in the genre. Wangdue Dzong is a subject so close to my heart because I have begun my career in the shadow of that majestic Dzong and have seen it every day for six years until one day I saw it being razed down to the ground. I wrote about it in iWitness. I have written many more stories on the Dzong during my seven years in Bajothang. Therefore I have special interest in anything that's about Wangdue Dzong. The official story stated that the fire was caused by an electric short circuit. The short circuit excuses helped solve many fire disaster cases, and Wangdue Dzong's was no exception. Beyond the official story, we looked no further because we took it as a sign of a fateful time that had come. Nothing could have stopped. No human was held responsible. In The Darkest June Author Karma Tenzin has woven a thrilling conspiracy around the June 2012 Fire. Two parallel stories begin in 1964, one in France and the other in Trongsa, and end in Wangdue in June 2012 with the fire. Professor JD has visited Wangdue Dzong two years before Jambay sees it on his maiden journey en route Trongsa to Thimphu. He sees a dream of Wangdue Dzong engulfed in inferno. The bad dream that he has that night under the tree in Wangdue haunts him for the rest of his life. Professor JD is found dead in his apartment only days before his journey back to Bhutan. He was going to return the diamond he discovered in the rock sample he stole from Wangdue Dzong two years ago to the government of Bhutan. His death puts the case to a long slumber until his granddaughter tries to connect the dots and finds the key to the locker where her grandfather has kept the papers and the diamond. Through Jambay's journey in Bhutan the author subtly takes us on a nostalgic ride into our past; beginning of towns and roads in the country. Jambay meets a nice Tibetan couple who gives him shelter in his initial days in Thimphu but his affair with the young wife makes him leave Thimphu. In Phuntsholing he makes a humble beginning with a warm Sherpa family and goes on to become one of the top businessmen. He marries into the same Sherpa family with their niece. Later his daughter helps him in his travel business. That's when the two worlds meet. Though Professor JD's granddaughter takes her share and drops her interest in the rock, his partners pursue their search for the origin of the rock in Wangdue. They book their many tours through Jambay's company. His unsuspecting daughter leads the final tour in June 2012. In 29 short chapters the books gives you doses of love, lust, family tale, wealth, crime,... and within a few hours you would be on the last page wondering if Wangdue Dzong fire was really caused by a short circuit. It gives wings to your own imaginations. You would find yourself playing with even more complex conspiracy theories as if to justify the loss of a great national monument. I have carefully avoided the details of the story to reserve the true charm and I must tell you not to judge the book by its substandard cover design. The book truly deserves a better cover and title font. And before I forget, please be warned that it's a work of fiction.